The war ended in 1975 has left a lot of monuments such as Hien Luong Bridge, Ben Hai River, Vinh Moc tunnels, Con Tien, Doc Mieu Temple, Khe Sanh, Ta Con airport… which are evidence of the illustrious history of the two ruling parties. The historical evidence has enormous significance, and is the living museum of the will and strength of Vietnam’s heroic revolutionary. The Hue – DMZ tour was built with the number of sites with historical feature and human values rather than natural sightseeing. Ravaged by the time and war through many ups and downs of history, DMZ retained as a testimony of unyielding heart, sustainable willpower and confidence of Vietnamese people. With a desire to learn more about the history of Vietnam war, we came to the land of Quang Tri – where there are still traces of the war, the evidence, and the historical markers. Visiting DMZ zone in Quang Tri has been always an unforgettable memory in my life. Not to miss any points of the journey, we started the trip from the Hue city center quite early in the morning (7:30 am) and transfer directly to Quang Tri province. We started the trip by visiting some places on Highway 9. At 9:00 a.m, we stopped at the first point, La Vang holy land. Here, we saw 3 artificial banyan trees, with reinforced concrete from 16.5 to 21 meters high. In the center is a marble altar. The statue of Our Lady of La Vang dwells on high, on a block of other square marble. Coming here, we also had a chance to drink water from Mary well. Leaving La Vang holy land, we drove to the second point, Dakrong bridge. The beautiful Dakrong river hides in itself the myths full of epic and humanistic. A graceful bridge is prominent among the untouched sky, rivers, and mountains. Stretching our hands in the middle of the bridge, we felt like hugging the sky. What a great feeling!. On the bridge, we met and saw some children of Van Kieu ethnic minorities playing and going to school, which helped us feel peaceful and understand more about their life. Our car continued to move to the battlefield of Khe Sanh and Ta Con airport. Along the way, we saw the Rock Pile hill, which America used to observe the operation of the Vietnam People’s Army. The hill is about 230 meters high and to reach the hill, reinforcements had to be transferred by helicopter. More than 1-hour drive from Dakrong bridge, about 11:30 we reached the Ta Con airport – a military outpost of the US military during the years 1966-1968. The relic is quite simple with five aircrafts (type C130, UH-1, CH-47 …), three tanks which were rusty display on the lawn. These are planes and tanks that the US military used in fighting in the battlefield of Khe Sanh – Ta Con for more than 40 years ago. Taking some photos, we imagined what happened in the past. After having visited the Ta Con airport – Khe Sanh battle, we returned to the city of Dong Ha for lunch and rest. At 4 p.m., our car continued to transfer to the Highway 1 to visit Vinh Moc Tunnels, which is considered the myth from the ground. Vinh Moc, located in Vinh Thach commune, Vinh Linh district, is a fishing village about 13km from Ho Commune, 7km from Cua Tung, and 30km from the Con Co island. In the war against the US, in addition to the common characteristics of Vinh Linh was “head of the northern route, the direct hinterland of the South”, the Vinh Moc also has an extremely important position for gathering and transporting food, weapons for Con Co. In 1964, US Air Force wanted to raze Vinh Linh, and Vinh Moc is not outside that area. In June 1965, no house in Vinh Moc was seen. To cling villages, hold land, continue to live and fulfill their mission with Con Co, Vinh Moc people had to dig underground tunnels. After three months of perseverance, arduous time with primitive facilities, a system of crisscross tunnels formed with the purpose of continuing to live and fight of Vinh Moc people . The entire tunnel was dug inside the hill about 30 meters deeper, more than 7 hectares wide. In spite of the deep, the air inside the tunnels is very cool. “It’s an air-conditioned tunnel”, my friend said. System of arched tunnel structure measuring approximately 0.9 m × 1.75m with 2034 m length, including multiple interconnected branches over 780m long main axis with 13 doors, is supported by pillars and wood. It is camouflaged discreetly. Three floors of the tunnels have different depth and functions: Level 1 is from 8 to 10 meters deep and is used to maneuver combat and be a temporary shelter. Level 2 is from 12 to 15 meters deep where villagers live. Level 3 is 30m deep where people transfer weapons to the island of Con Co. Going inside the tunnels, we understood more about the hardship and perseverance of Vietnamese people and felt proud of our country. Also, in the hall there are tunnels, wells, Hoang Cam stove, rice warehouses, …. After visiting the Vinh Moc Tunnels, we returned to Hue. On the way back, we stopped to visit Ben Hai river and Hien Luong Bridge. Ben Hai River is about 100 km long and derived from the Annamite Mountains, flows along the 17th parallel from West to East, into the sea at the mouth of Cua Tung. 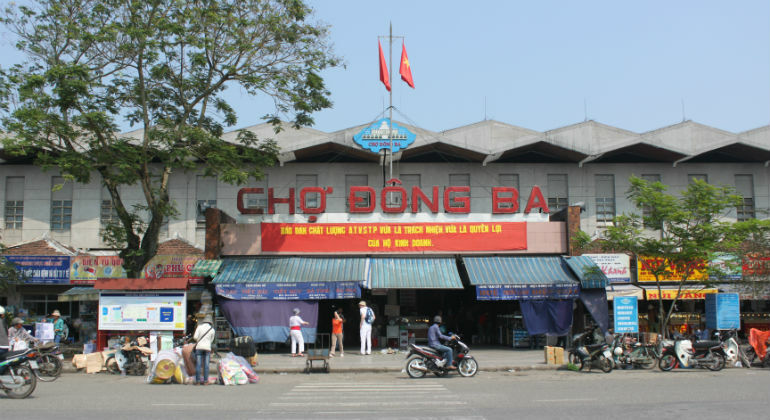 After the Geneva agreement in 1954, Quang Tri – which crosses the 17th parallel, was divided into 2 regions and the demilitarized zone was established along the two banks of the Ben Hai River, 5km from the riverfront each side. The north is the liberation of our army and people, and the south is under US control area. Crossing Ben Hai River is the Hien Luong Bridge. Hien Luong Bridge is a long story of the people on both sides. The distance is just a bridge, but people on the both sides can look at each other but can not meet. Only exist until 1967 but it is symbolic of the direct division. Besides the bridge, we also saw a flagpole. To encourage the confidence of people on both sides of the Hien Luong bridge, our Party and Uncle Ho maintained the flag, but the enemy always wanted to destroy the flagpole. Along with Ben Hai River and Hien Luong Bridge, the Hien Luong flagpole is the symbol of the immortal fighting spirit, the belief of winning, aspirations and national unity of our army and people. Years have passed, there are no more frontiers, but the river, the bridge, and the flagpole are still the epitome of the war in Quang Tri, a symbol of the strength of Vietnamese people. End of a long day in Quang Tri, what remains today are crystallized from the blood, sweat and tears of the hard war time. We ended the tour with lots of emotion and feelings and we will never forget this meaningful trip.